(AFP) US President Donald Trump signed an almost $750 billion defense spending bill Monday, while vowing a new “Space Force” would give America dominance over rivals in China and elsewhere. 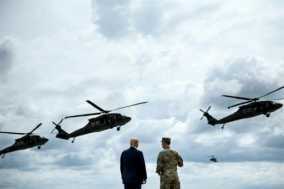 “Our competitors have begun weaponizing space,” Trump warned troops at Fort Drum in New York state, as he signed a National Defense Authorization Act passed by Congress earlier this month. “It’s not enough to have American presence in space. We must have American dominance in space,” Trump said, as he warned of the threat from China and elsewhere. He specifically mentioned a “new” Chinese military division that oversees space operations. The spending bill contains a number of important provisions, including a prohibition on delivering F-35 Joint Strike Fighter aircraft to Turkey, a NATO ally unless they ditch Russian technology. Trump has sparred with the country’s leaders over the detention of a Christian pastor. It also extends a restriction on US-Russian military cooperation, something the White House vociferously opposed.